The flowers of cherry trees have been admired by the people of China, Korea and Japan for over 1300 years. The term sato-zakura – literally, “village-cherries” – refers to flowering cherries “of garden origin” that are grown for their floral display. These trees do not occur in the wild -- they result, instead, from complex crosses involving various cherry tree species native to or naturalized in Japan. In botanical terms, they’re cultivars (cultivated varieties). Cherry blossom viewing (hanami – literally, “flower-viewing”) is even today an important spring ritual in Japan. In the Heian Period (794-1185 A.D.), it was celebrated only by the imperial family, but eventually it was observed by the common people as well. Today, people of all ages stroll or sit under the flowering trees, and celebrate with meals, toasts, songs, haiku poetry -- or simply by delighting in the exquisite, all-too-brief display. Unlike plants with flowers that wither and die on the tree, the cherry sheds its flower petals -- at the peak of their beauty -- in just one or two weeks, depending upon the weather. For the Japanese, this fragile loveliness symbolizes the evanescence of life. In Japan, flowering cherries are most often planted in parks or other public spaces instead of in traditional Japanese gardens. The latter, planted with maples, conifers, azaleas and mosses, are characterized more by their myriad shades of green rather than the bright colors of flowering plants. Nevertheless, the Cherry Orchard (Area U, north of the teahouse) is an important element of our Seattle Japanese Garden, which does not simply consist of the physical elements typical of Japanese-style gardens. It embodies many aspects of Japanese culture as well. Three types of deciduous, spring-flowering trees are planted in the Cherry Orchard: crabapple (Malus), flowering plum (Prunus mume) and most importantly, flowering cherry (Prunus serrulata cultivars – ‘Kwanzan’ and ‘Shirotae’). Both of our cultivars include the species word serrulata in their botanical names, but unfortunately, this is confusing. There are several varieties of Prunus serrulata (known as “mountain cherries”) native to Japan, but the simple P. serrulata nomenclature of the cultivars doesn’t indicate the complexity of their breeding – which includes many cherry species in addition to one or more “mountain cherries”. In the early 20th century this confusion was compounded: ‘Kwanzan’ was given the name Prunus serrulata forma purpurescens, and ‘Shirotae’ was given the name P. serrulata forma albida. Luckily, these botanical names are not in common usage! Characteristic of both of trees in the Seattle Japanese Garden – and sato-zakura cherries in general -- is toothed foliage that’s oval or ovate-lanceolate (oval-shaped, tapering to a point at each end) in shape, and arranged alternately on the stems. They also have polished-looking, reddish-brown or grayish bark marked with paler-colored horizontal lenticels (raised pores on the stems of woody plants). Blooms are borne in pendant clusters – usually of 3-6 flowers each -- but petal counts vary considerably. Some cultivars have 5-petaled flowers, like wild-growing cherries, and are known as singles. Those with more petals are referred to as semi-doubles or doubles. ‘Kwanzan’ is the earlier of our two cultivars, and apparently dates back to at least 17th century Japan, where it was known by other names, including ‘Kanzan’ (an old, poetic word that means “bordering mountain”), ‘Kansan,’ ‘Sekiyama,’ and ‘Sekizan.’ Plants offered under these various names may have slight differences. Under the name ‘Kwanzan’ – which is an obsolete spelling of ‘Kanzan’ – it has become the most popular flowering cherry in the U.S. In Japan, it is often planted around Tokyo, but is less common elsewhere. ‘Kwanzan’ is well-known and frequently planted in Seattle. It is very free-flowering, with 2 ½ inch-diameter, double (23-28 petals) flowers that emerge deep red-pink, then fade to a paler color. Historically, in Japan, these large, very double flowers would have been assessed as rather gaudy. ‘Kwanzan’ has very large leaves that are well-developed during flowering. They emerge dark bronzy-red, are green in summer, and often turn an attractive orange-bronze in autumn. When young, it has a stiffly upright habit, but becomes vase-shaped and wider-spreading with age. Grown on its own roots, it may reach 40 feet tall & wide, but most plants for sale in the U.S. are grafted on other rootstalks, and do not attain this size. The ‘Kwanzan’ trees in our Orchard were planted between 1988 and 2006, replacing older trees that were not thriving or had died. Several more mature specimens are planted outside the garden, in the picnic area west of the parking lot. The Japanese word shirotae refers to a white cloth made from fibers of the paper mulberry tree. Similarly, the cultivar ‘Shirotae’ has flower petals that are pure white, thin, smooth and clothlike. It dates from at least early 19th-century Japan, when it began to appear in gardens and plant collections. It was later exported as ‘Mt. Fuji’ to Europe and the U.S. This reference to Japan’s lovely Mt. Fuji is appealing, but has caused unnecessary confusion: Prunus incisa, known as the Fuji cherry, is unrelated to ‘Shirotae’. ‘Shirotae’ (also known as ‘Mt. Fuji’ & ‘Kojima’) usually blooms somewhat earlier than ‘Kwanzan.’ Flowers are very large (2-inch), fragrant (with an almond-like scent), and pure white, opening from pinkish buds. Semi-double, they consist of 5 petals, plus 1-6 related petal-like elements (petaloids). Leaves are well-developed during flowering. They emerge pale green with a bronzy tinge, and have delicate, long-fringed teeth. Fall color is not notable. Shirotae’ is a small tree, maturing at 15-20 ft. tall, but spreading much wider with time. It’s easily recognizable by its large, lovely flowers and low, flat-topped, horizontal growth habit. 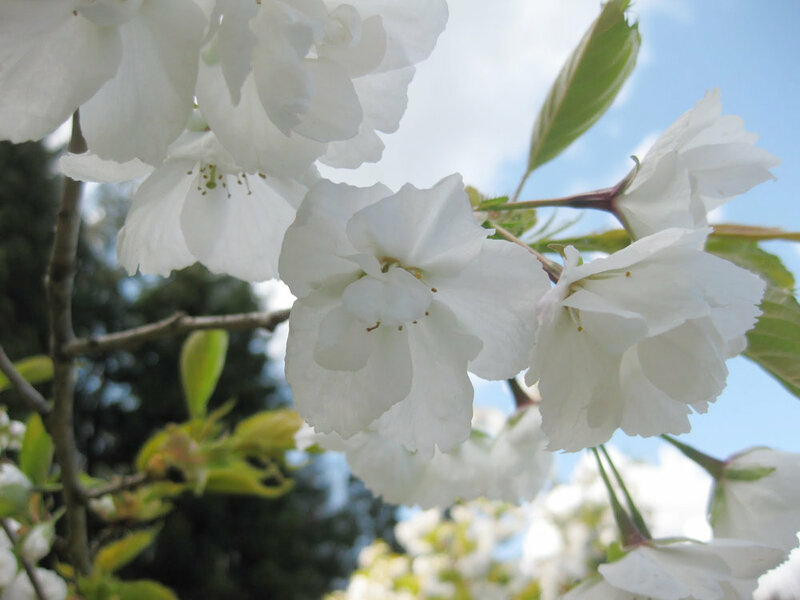 Wybe Kuitert, author of Japanese Flowering Cherries, concluded that “if it gets the room it deserves, it is without doubt the most gorgeous white-flowering cherry.” Our Orchard has several relatively young plants. Flowering cherry trees grow best in full sun -- in rich, moist, well-drained soil. However, they are susceptible to insects and various diseases, particularly a fungus known as cherry blossom brown rot, and in general do not thrive in the Pacific Northwest. They are considered short-lived here, and often need replacement after 20-30 years. Fortunately, both ‘Kwanzan’ and ‘Shirotae’ are somewhat disease-resistant, appearing on a list of “cherry trees recommended for the PNW,” but they too need periodic replacement. With the brevity of their lifespan as well as that of their annual flowering, these lovely trees reveal the evanescence of beauty, and the quality of impermanence embodied Japanese-style gardens true to their cultural heritage -- including our own Seattle Japanese Garden.